For years, I’ve made rings out of silver quarters, bashing them against a ring mandrel with a heavy maul and shaping the metal with a file. But my technique removes all traces of the printing on these coins, producing a very durable silver band that resists tarnish instead of coin rings. When I saw John Wild’s coin rings this summer at William Holland School of Lapidary Arts, I had to have one, even if I had to trade for it. 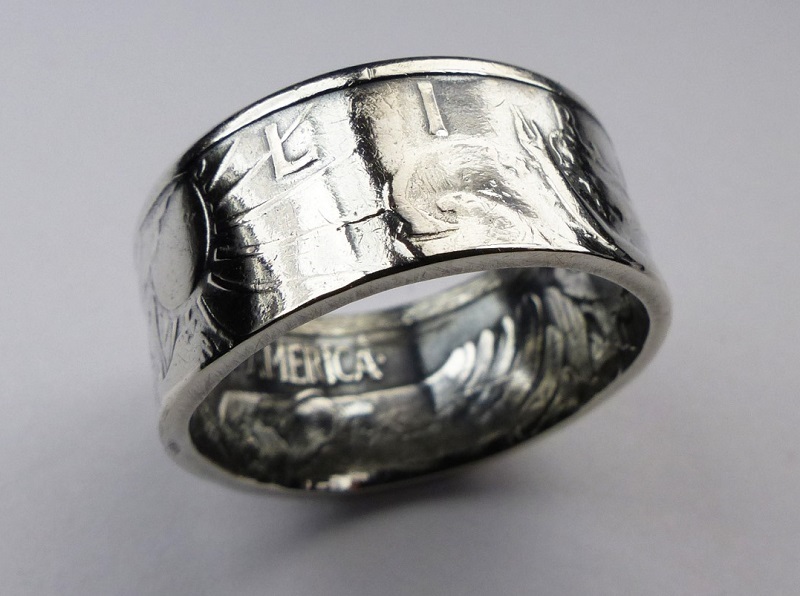 John’s rings are formed out of 50-cent pieces and silver dollars, and all of the coins’ original details are preserved inside and out. For variation, John darkens some of his coin rings with liver of sulfur or applies colorful powder coating, that, when baked on, looks like enamel. Or both. John came across the technique by accident a couple years ago when he spotted a YouTube video while searching for something else. “There was this guy, Jason Stinchfield, making coin rings, and he had so much enthusiasm,” John says. And when the video ended, John realized he had all of the equipment he needed to start, except for a die punch. A trip to Harbor Freight solved that problem. Since then, John has invested in ring forming tools that Stinchfield sells. 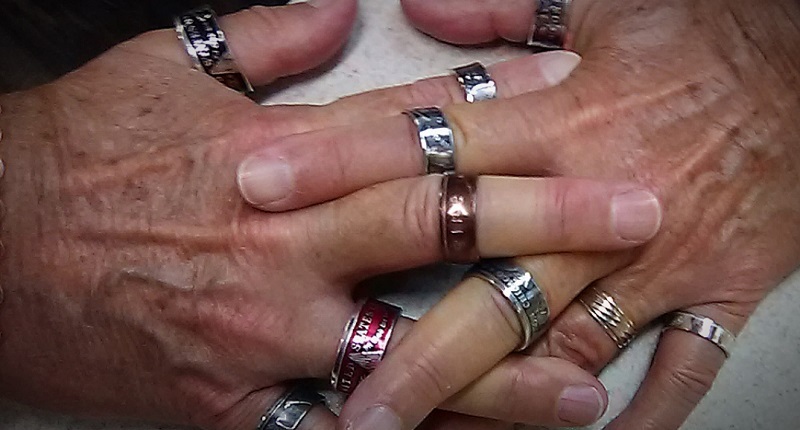 “It’s unique,” John says of coin rings, which are showing up everywhere, thanks to the internet and word-of-mouth. Some people want the coin rings for sentimental reasons, such as to commemorate the year they were born. Others turn military memento coins, even “sobriety” coins, into rings, he says. Although one YouTube video shows a coin ring being made in two minutes by a maker who goes by the name of Fencekid, John says it takes him an additional 30 minutes to file, sand, and polish a ring. John sells quarter rings for $35, 50-cent piece rings for $55, and silver dollar rings for $95. Unless you trade him a couple slabs of Michigan copper in matrix from the UP, because John also cabs rock. P.S. The last US coins containing 90 percent silver were minted in 1964. 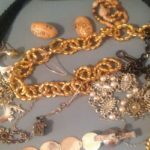 It is not illegal to turn coins into jewelry. Learn more about metal forming techniques in the Interweave Store!